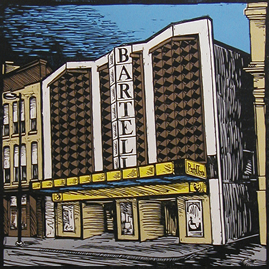 The original building which now houses the Bartell Theatre Foundation was a brick shell with three wooden floors, was built in 1906 by Frederick W. Kehl and was called the Colonial Hall, home of the Kehl Dance Academy. Shortly after opening, bowling alleys were installed in the first floor. The second floor held the Colonial Hall, a large meeting room in which dance recitals were held frequently as well as meeting of various community groups. The Kehl Dance Academy occupied the third floor with office and dance studios. Frederick W. Kehl and his wife Barbara D. (also known as Dora) continued to teach Colonial Halldancing – modern and classical ballet, ballroom, tap, and more – for many years in the top two floors. And About 1913 a Mr. F. W. Starkweather became the manager of the Colonial Hall and converted the Bowling Alleys into the Colonial Pool and Billiard Club, Inc. In 1916 it was the Capitol Bowling Alley, and in 1917 the left side of the first floor, with address 115 E. Mifflin, housed Mr. Joseph Falci’s Shoe Repair Shop while 113 E. Mifflin was where the Kehl and Schillinger Bowling Alleys were located. The building had both addresses, 113 and 115, when it was first built, but exactly how it was divided and re-divided is lost in the past. We believe there were stairs to the upper floors at both front and rear of the building, but details are missing. The Kehl Dance Academy became the Kehl School of Dance and the Colonial Hall became The Ballroom as ballroom dancing grew in popularity during the years before and after World War I. The Kehl dancers were known for extravagant shows like the living flag demonstration and a flowery tap number that traveled down the Capitol steps. Changes in the first floor were more frequent and more dramatic. The Joseph Falci shoe Repair was gone in the 1921-23 period with the Capitol Bowling Alley and the Capitol Billiard Parlor occupying the whole first floor. By 1925, Lenahan & Dodge had taken over the billiard parlor, and Mrs. Anna Jennie had installed a restaurant where Falci had been. Two years later George C. Larson had replaced Mrs. Jennie at the restaurant and in 1929 it was the Dugan & Pratt Restaurant and Lanahan had left the billiard parlor entirely to Dodge. In 1931 the restaurant changed hands form Dugan & Pratt to Sampson A. Cribos, and in 1935 Frederick Hess set up a shoe repair service and bicycle repair shop somehow in the bowling alley side. I wish we had more information about how that was arranged. By 1939 the restaurant had become Sharon’s Bar and Restaurant, and Colonial Hall had been renamed Uptown Hall. Four years later Sharon’s was replaced by P&G Cafe and Tavern. The rapid turn-over in the restaurant area continued with Sharon’s returning by 1946, the same year that Leo Kehl sold the building to the Veterans of Foreign Wars Post 1318. The VFW renamed the second floor The VFW Memorial Hall and it continued to serve the community as a convenient place for meetings of all kinds; weddings, political rallies, dances, and community groups. Sharon”s Bar and Cafe became Lochner’s Bar and Restaurant by 1951 and then the VFW Tavern a couple years later. The Veterans of Foreign Wars Post 1318 owned and enjoyed the building for more than 20 years with few changes. In 1966 it was sold to a group of real estate developers that included Gerald a Bartell (total coincidence!). For the next three years the first floor of the building housed Mr. McDonald’s Barber Shop and the Herlitz Tap Tavern before it was extensively renovated to create the Esquire Movie Theater. Converting the 63 year old building into the Esquire was pretty drastic. Everything inside the building was removed, from the ceiling of the third floor to the ground the building sat on. The entire front was removed and replaced by a massive poured concrete structure to make the entry, rest rooms, projection room and balcony of the movie theater. Truckloads of fill material were graded to make the raked seating area on the lower floor, and a small stage and proscenium was built in front of an emergency rear exit for the projection screen and sound equipment. The Esquire was owned and operated by Marcus Theaters, Inc. until about 1991. When it first opened, the Esquire was popular and profitable, but attendance dropped, and in the 80’s the Esquire was modified to make the balcony a separate theater with a second projection room built for the lower floor. Business continued to decline, the Esquire closed and Urban Land Interests bought the property to be part of its planned development of that block. In the Spring of 1994 our small group, Tom Haig, Karen Tusack, Leo and Lee Ann Cooper, representing Madison Theatre Guild, Strollers Theatre, Reprise Theatre, and Mazo R&R, found out about the Esquire, decided we wanted it and set about making it happen. In September we incorporated the Foundation, by November we had preliminary drawings and specifications for the renovation, in December we obtained a $100,000 TIF grant from the City of Madison. There is not enough space in this article to describe how we collected $680,000 in cash and services, how volunteers provided more than 4000 hours to gut and then refinish the building while Tri-North did the heavy work, nor to give credit to all those who worked and gave so much to create our beautiful Bartell Theatre. However, we continue to appreciate the dedication they showed by supporting the Bartell.